Sometimes with my hectic schedule, I procrastinate on projects that would actually benefit my own trumpet playing. I have been playing on my Mike Vax Yamaha for years and never had Jim Becker look at my valve alignment. Recently, while playing Jesus Christ Superstar, I felt something was off with my 4th space E and the E an octave above. So, for my birthday, I treated myself to a Precision Valve Alignment by Jim Becker. Sure enough, my valves were way off. When Jim was done, the E’s lined back up, and the core of my sound was consistent from top to bottom. I feel much more confident blowing through the notes on my horn, as opposed to “hoping” the horn settles on a particular slot. Both Jim Becker and I highly recommend Precision Valve Alignments on Yamaha Trumpets, especially the Bobby Shew medium bore horns. 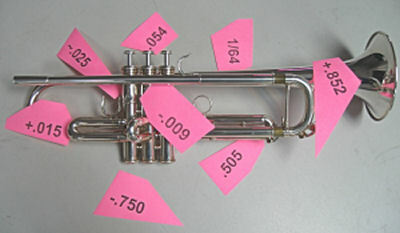 The Bach C trumpet is the trumpet we perform the most PVAs on. I would say that in general, a Precision Valve Alignment by Jim Becker will add 10-15% improvement in your horn’s stability. That’s sometimes the difference between a good day of trumpet playing and a bad one. Feel free to contact the store if you have any questions on your possible PVA.